Late Wednesday, Whole Foods said it expects sales at stores open at least one year to rise between 6.6% and 8% in fiscal year 2013. It had previously forecast same-store-sales growth, a key measure of retail demand, to increase between 6.5% and 8.5%. Despite the sales outlook, Whole Foods maintained its guidance for full-year earnings in the range of $2.83 per share to $2.87 per share. For the first quarter, which ended Jan. 20, Whole Foods said earnings rose 24% to 78 cents per share. Whole Foods warned that its profit margins will be squeezed this year as it increases "value offerings" to boost competitiveness. It also expects to spend more on "pre-opening and relocation expenses" associated with the opening of 10 to 12 new stores in the fourth quarter. While the more modest sales forecast took a toll on Whole Foods stock Thursday, some investors were willing to cut the company some slack, according to the latest chatter on Stock Twits. $WFM 3-7% down is not a big deal. That happens on down days without ER for other stocks. IMO great co. & should be ~100 in a few wks. If that's the case, the sell-off is a potential buying opportunity for those who see Whole Foods as a good long -term bet. Others were more cautious. The economy remains sluggish and that's not good for sales of arugula. 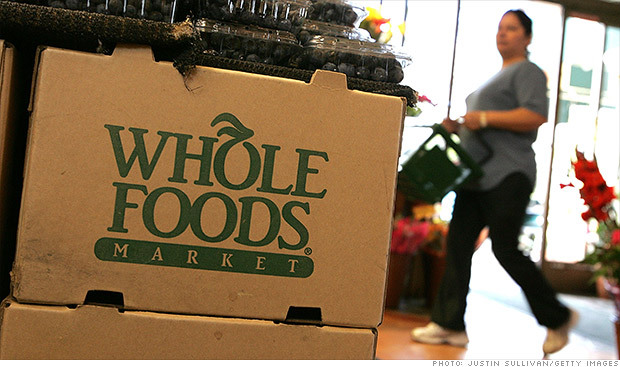 Plus, Whole Foods is still a relatively young company and could be suffering for growing pains. $WFM going through a lumpy period of growth right now where they need to figure out how to do this at scale.